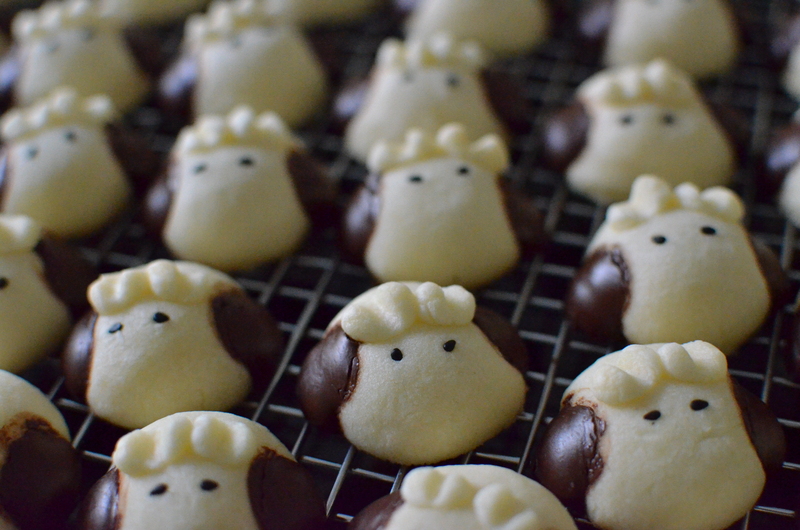 Please check out these two blogs for detailed directions: Baking’s Corner: Fatty Sheep German Cookies – by Abigail Ngan. Beat butter and sugar till fluffy and light in color. Sift in potato starch and flour, mix to form a soft dough. Chill the dough for 30 – 45 mins for easier shaping. Bake at 300 degrees F (at the middle rack) for 20 min. The cookies need NOT to be brown / golden. (different oven will require slightly different temperature and baking time). 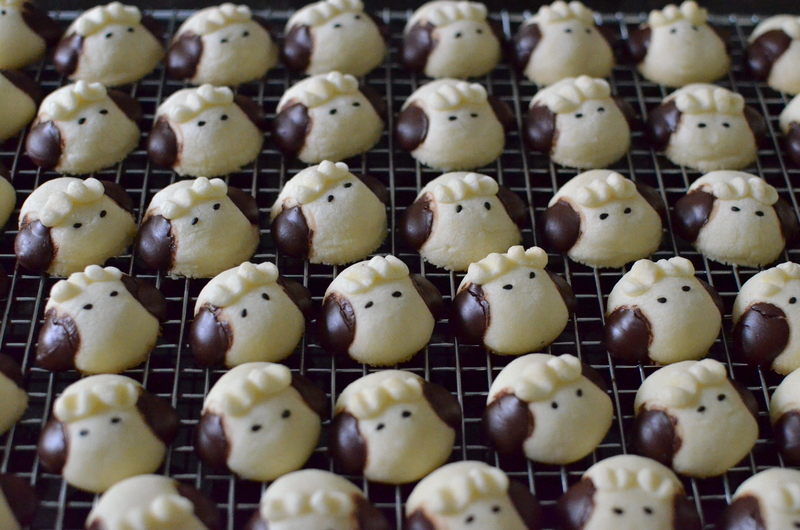 After slightly cooled, move cookies to a rack to cool completely before storage. NOTES: The ones my friend made and the ones from the website didn’t slide and the chocolate should not melt. 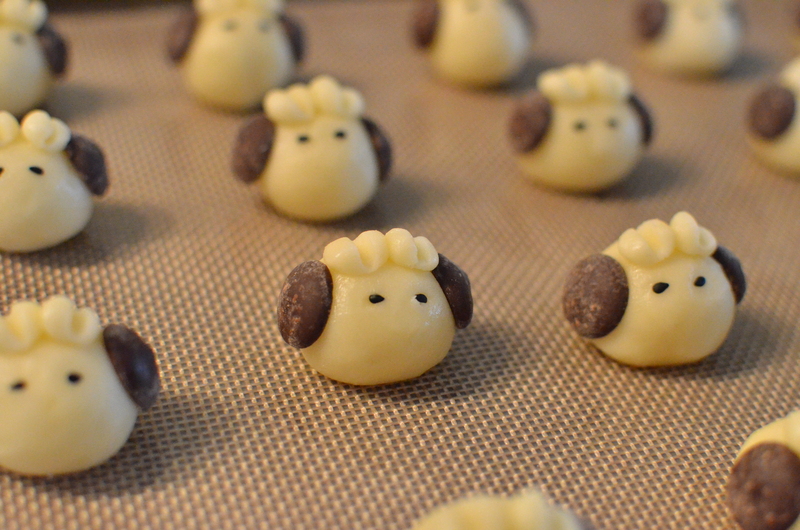 But my chocolate chips melted within first 10 minutes so the sheep ears are sort of sliding down and cracked. The body didn’t hold the ball shape too after baking, so I think it’s all because of my oven is hotter than other people’s and I followed the recipe to place the baking sheet towards the top rack. I recommend to just bake in the middle rack and check the cookies during first 10 minutes to determine how to adjust the temperature and baking time. Regardless mine didn’t turn out as nice as the ones in the blogs, it’s still a perfect gift to make for my family and friends. So cute !